Viva Infomedia Pvt ltd is honored and proud to be awarded as the Best in small and medium sector enterprises. The awards, jointly organized by ICICI Bank and CNBC, seek to recognize India’s most globally competitive SMEs. We are over the moon especially to be felicitated by the Honorable Home Minister of India, Mr. P Chidambaram. It is highly satisfying that our efforts have been recognized. Emerging India Awards has become a platform of repute to showcase India’s best SMEs, and we are happy that we have been recognized by them. We were chosen after a robust 3 phase methodology, powered by CRISIL – Viva Infomedia Pvt Ltd is ecstatic to be the winners of the world’s most widely participated business awards, the Emerging India Awards. The ICICI Bank – CNBC-TV18 Emerging India Awards recognizes and honors India’s most globally competitive small and medium enterprises that are redefining the benchmark of excellence bringing them at par with top global organizations. 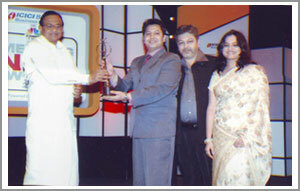 CNBC-TV18 Emerging India Awards 2009 are presented by ICIC Bank Business Banking and powered by CRISIL.